The Grateful Life coauthor Nina Lesowitz was recently interviewed by Like a Boss Girls on how gratitude can help entrepreneurs get ahead. First, people need to practice gratitude every day. Expanding on neuroscientists' theory that our brains have a negativity bias, Lesowitz points to gratitude as the catalyst to break negative thinking. "In a state of thankfulness, we tend to be optimistic. When not, we’re looking at all of the obstacles and barriers.... Gratitude is a tool to help us rewire our brains to think positively. Thepractice gratitude on a daily basis changes your brainwaves, and that would really help a young entrepreneur, because you would get rid of all of the mental barriers. It opens up your brain to think more positively." 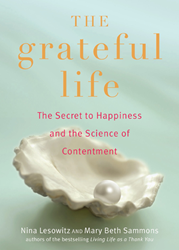 The Grateful Life is a guide to discovering—and realizing—your dreams through the power of positivity. What can gratitude do for you? Recent studies have shown that gratitude will make you calmer and healthier, as well as bring higher levels of satisfaction to all your relationships. Each of the ten chapters illustrates the benefits of this new approach to your life, including “A Serving of Thanks a Day Keeps the Doctor Away: Science Substantiates the Health Benefits of Gratitude,” “The Grateful Workplace: Increase Productivity and Happiness While You Work,” and “The Secret to a Gratitude Makeover: How to Create Gratitude Practices That Stick.” It is also available as an audiobook.